Give your kitty one tablet a day of Standard Process’s Renafood tablets or Feline Renal Support. We give one Renafood supplement tablet to all our cats starting from 7 years of age just for additional support from the aging process. 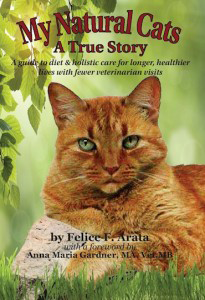 None of our cats past or present had kidney problems. DR Gardner once started our Lady N on it when her kidneys started to elevate at age 16 along with our My Natural Cat raw diet. After she was on the tablets for 30 days I rechecked her blood work and the levels went back into the normal range. We are very impressed with this additional supplement to support the kidneys and continue to give all our cats’ one crushed Renafood tablet a day mixed with the organic dried chicken treats. Every night before bedtime I call out “Treat Time” and the come running to get their vitamin treats. I can only sell from my personal stock by request because Standard Process will only allow Vets or Dr’s to sell their products or you can order them from Dr Gardner at drgardner@petsynery.com or 866-551-8487 and 800-383-6008. There are 90 in a bottle for about $18.50.